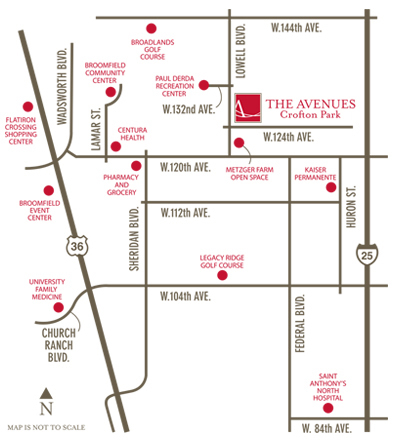 The Avenues Crofton Park Apartments is situated in the desirable neighborhood of Broomfield, Colorado, conveniently located between Boulder and Denver. Our community borders Metzger Farm Open Space, a 152-acre open space in Broomfield with dedicated walking and bike trails. The Avenues is minutes from shopping, dining, entertainment venues, and the 85,000 square-foot Paul Derda Recreation Center.